Overshadowed by its TV-hogging siblings, Mario Kart: Super Circuit is often relegated to a footnote in Mario Kart lore. Developed by second-party stalwart Intelligent Systems (who’d recently provided Nintendo with the charming Paper Mario) and released early in the Game Boy Advance’s life cycle, the title never managed to grab the attention that other, more experimental entries in the series would attract. A shame, but perhaps not entirely unexpected – at first glance Super Circuit is Mario Kart by numbers; a fusion of technical implementation and artistic direction that borrowed from Super Mario Kart and Mario Kart 64 in equal measure. While Nintendo had vehemently disputed comparison of the GBA to a portable Super Nintendo, a title that so heavily aped Super Mario Kart (going so far as to include all of its courses) only aided the perception that Nintendo were dusting off (or in the case of Super Mario Advance, chopping up) their SNES catalogue and charging players £35 for a lick of paint and some grating voice samples. The first game in the series to visibly show a character’s stats, players would earn higher ranks for completing courses as “poor” characters. Nor was Super Circuit afforded the solitude that had been granted to its predecessors. The GBA launched with several racing games to compete against, having been beaten to launch by Konami Krazy Racers, Super Circuit had to battle against titles like Nintendo’s own F-Zero: Maximum Velocity for hearts and wallets alike. While Goemon and the rest of Konami’s creations weren’t as recognisable as the likes of Mario and Bowser, these titles added to a sea of SNES-like racers and made it harder for Super Circuit to distinguish itself. 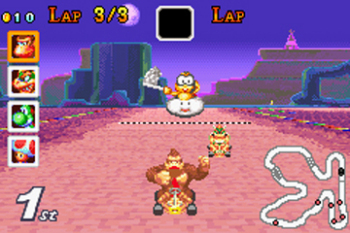 The game’s steering mechanics closely aped that of Super Mario Kart, with its flat courses featuring plenty of hairpin turns and narrow pathways to negotiate – even on 50cc, the races felt pacier than Mario Kart 64‘s sprawling experiments. Drift boosting was gone, though players could get a secondary “boost-start” after being rescued by Lakitu. Coins had returned, this time placed in neat clusters rather than the sprawling, corner-hugging arrangements of the past. 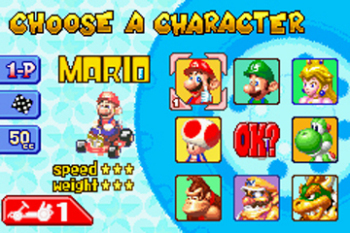 While Mario Kart entries tend to take visual inspiration from the most recent entry in the core Mario series, there had been none since Mario Kart 64 – that game fashioned character sprites out of high-fidelity 3D renders, and Super Circuit did the same, the roster remaining unchanged this time around. Mario’s arsenal was familiar, too – most items (and the ability to drag them) were ported across wholesale. The golden mushroom was notably absent, as the normal variant once again gave a burst of speed (as in Super Mario Kart) rather than maintaining top speed over rough terrain. Super Circuit has just four images on Nintendo’s web page, most with a conspicuously drab colour palette. If the mechanics and weaponry were overly familiar, however, players could at least enjoy exploring a plethora of new environments, many of which have yet to return to the series. Accompanying the traditional tarmac circuits and frozen lakes were such memorable entries as Cheese Land (obliquely set on the moon), the celebration-themed Ribbon Road, aquatic Ghost Houses and deserts with both Egyptian and Wild West motifs. Several of these courses changed dynamically as the race progressed, with the sun setting behind distant mountains and periodic volcanic eruptions. While these events never fundamentally altered the player’s route, few Mario Kart tracks since then have undergone such striking visual changes mid-race. Yet despite this variety, it seemed as though Bowser had been bribing someone at Intelligent Systems – counting the tracks from Super Mario Kart, the game features a staggering seven Bowser Castles in all. Not all of the game’s visuals were praiseworthy. While the backgrounds featured several layers of parallax scrolling, they moved far too little to present a convincing skybox instead became disconnected and distracting. 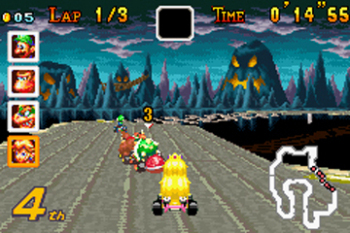 Additionally, no attempt had been made to reduce the many HUD elements from Mario Kart 64 and, in fact, an arcade-style “turn warning” had been introduced, cluttering an already tiny screen and making shortcuts at the periphery of the track hard to spot. The Lightning Cup starts out, appropriately enough, on a rain-soaked circuit with puddles that spin you out on contact. Like many GBA games, Super Circuit used a bold, sometimes gaudy colour palette to provide contrast on the Advance’s dull and unlit screen. Unfortunately, this led to some ugly screenshots for the game’s release – a perception not helped by the introduction of the Game Boy Player, a Gamecube peripheral that often brought games to the TV in a less than flattering light. At least the soundtrack remained varied and rich in texture despite the GBA’s limited audio capabilities. 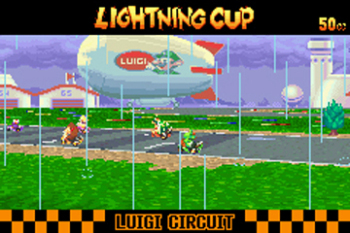 Yet if Super Circuit could claim real harm from the GBA’s oft-revised hardware, it was in the effort necessary to play multiplayer matches. Linking together multiple handhelds required a complicated web of (rather pricey) cables that left people jostling for light and comfort. While the game commendably featured single-cart multiplayer, restricting very little other than the character roster, the full game required a significant amount of setup for an experience that wasn’t significantly improved over what had come before. This was one Mario Kart that, more than ever, needed to survive on its single-player merits. The sky in Sunset Wilds turns from orange to deep purple as you race. While the solo experience had ironed out some of Mario Kart 64’s frustrations – rubberbanding was still present, but less intrusively apparent – the decision to lock away the game’s content proved an unpopular stumbling block. While Super Circuit boasted forty tracks in total, players had to complete every single cup at least twice over (and with enough coins) to unlock half of them. For those looking for a kart ride down memory lane, it was an annoyance to say the least… and the execution of the coveted retro courses was haphazard, missing their original graphics, coin patterns and many of the obstacles. With the Gamecube’s arrival so soon after Super Circuit‘s debut, attention soon shifted to the promise of a “next-gen” Mario Kart; a title with 3D, rumble and internet play – Nintendo had already shown a brief E3 teaser. With little innovation on display, Super Circuit was a solid but unremarkable entry doomed to second-fiddle status by an unfortunate combination of Game Boy logistics and Nintendo’s own hype machine. Even today, it’s a curio: the plaything of 3DS early adopters, bereft of its multiplayer and left to languish in the shadows. And yet the notion of retro courses endures – perhaps Super Circuit‘s creators can take heart in the possibility that their best tracks, many yet to be revisited, may one day be appreciated in Mario Karts to come. This entry was posted in Gaming and tagged Mario, super circuit, Super Mario Kart. Bookmark the permalink.